Subject: Antique print, titled: 'L' examen a l' arrivee.' - The examination of a horse at the finish. 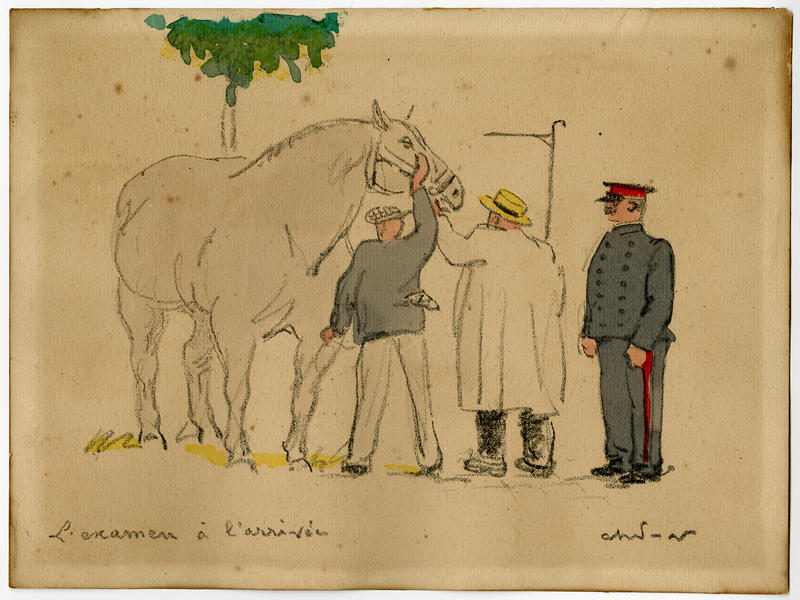 A man in uniform looks on while a man in a boating hat inspects the horse. The jockey pacifies the horse. Condition: Very good, given age. Some small stains in the edges. Top right corner browned. Ghosting from previous matting. General age-related toning and/or occasional minor defects from handling. Please study scan carefully. Medium: Facsimile print with hand coloring on laid paper. Size (in cm): The overall size is ca. 24 x 17.9 cm. The image size is ca. 20 x 22 cm. Size (in inch): The overall size is ca. 9.4 x 7 inch. The image size is ca. 7.9 x 8.7 inch. Artists and Engravers: Made by 'Anonymous' after own design. Signature (lower right corner below image) illegible.